Navico Broadband Radar, truly safer? When you read Tim’s article, Hazardous to Your Health?, it’s obvious he did some serious research into the mysterious world of “radiosity” and the workings of the International Commission on Non-Ionizing Radiation Protection (ICNIRP). But was “rest easy” a reasonable conclusion? By way of rebuttal, Navico got Dr R.S. Mowbray to summarize the hazards of small radomes. You can read/download the PDF here, and I think you’ll find it informative. I, for one, have never seen a summary of “safe distance” recommendations like the table above, and I’ve looked. Plus I’ve never read as clear an explanation of the difference between “Occupational” and “General Public” radiation limits, and isn’t it strange? A professional mariner can handle ten times more exposure because he or she is more aware of the danger? But, overall, I remain confused about this vague subject, and am very curious about your thoughts. And let’s discuss in real terms. Would you be comfortable sitting for hours on a fly bridge with a conventional magnetron radome pulsing within, say, four feet and nearly level with your eyeballs, or other balls? I’ve seen installs like the latter, and really don’t know if the situation is “rest easy” or “not absolutely intrinsically safe” (as Dr. Mowbray puts it). No radiation is better than some radiation. Therefore less radiation is better than more radiation, right? I believe that any rational person, given the option, will choose less radiation all other issues being more or less equal. It seems clear that if one’s requirements mean exposure to more radiation then that is the option. If only hats made of foil were a little more stylish. I take this to mean the Occupational person to be the one who relates to the radar as an occupation, such as the installer or maintainer, not the user, meaning General Public. The distinction is one of getting inadvertently higher but brief exposure, in the act of maintenance in close proximity. The user should be educated by the system vendor as to the risks and should know the energy cross section in the area of occupancy. The installer should have and use a RF survey meter and should share the results with the buyer. As a military radar engineer, I can say that the safe distances are valid only if you are standing directly in front and in dead center of the beam. Of course, Radar Arrays are designed to be highly directional. Even one foot above or below the center of the beam will extend those distances by a considerable amount. One should read the warning understanding that these non-ionizing RF emissions are generally very, very low power compared to ionizing emissions like x-rays. For example, an x-ray is at least 1,000,000,000 (1 Billion) times more powerful than any marine radar at any power level. I for one feel that my sexual organs are quite safe while I’m running my conventional radar all the time. That said, the new technology is interesting even if it is not nearly as good at long distances yet. “Occupational” and “General Public” radiation limits. I suspect this definition is legal with regard to liability. The “occupational” is assumed to be fully informed and has given his consent, the “general public” is not informed and could claim harm. I’m not a medical researcher, but biologically I’m pretty sure the “occupational” guy is just as vulnerable as the general public! I agree with Butch, less is better. So these standards committees calculate a dose for workers that increases their overall risk from working by some small amount(10% seems to come to mind), compared to all of the other risks that are seen in that particular profession. This calculation assumes that risk is linear with dose, which is in itself a conservative assumption. Then, the allowable dose is cut by some safety factor (10 in this case) for the general public. For special groups like pregnant women, the safety factor can be even higher. Even though there are these dose limits, for ionizing radation, at least, the As Low As Reasonably Acheivable (ALARA) principle is also followed, to try to keep doses well below the limits. In the case of ionizing radation, this has been quite successful and few people in the ionizing radiation business ever get near their limits each year. Having worked inside a running syncrotron accelerator (an xray machine 2x larger than a foot ball field), with xray badges and safety training, I take any xray exposure seriously. But still … the level of exposure from marine radar is just too trivial to enter into a decision of where to place the radar on my boat (within reason … level with my head, maybe not), and certainly not worthy of effecting a buying decision. Selling BR on the merits of radation is a marketing mistake. Ask Airbus 🙂 … they pulled their consumer advertising (to compete with Boeing) of the additional safety of 4 engine jets over 2 engine jets, once someone from the airlines realized the entire industry suffers (fewer flying passangers in this case) when FUD is misused in marketing. *** Navico *** … please do a favor for all those who sell marine electronics products, and kill this advertising quick. Just imagine … if people stopped buying radar systems for a while, fearful of the radation, and choose to wait for BR systems to mature. How that would effect the people who resell Navico equipment today ? Remember, cops used to use continuous duty RADAR guns for traffic enforcement and when not using them, left them in their groin. From what I remember, there were quite a few testicular cancer claims. Whether this is urban legend or fact, I don’t know, but I’m sure such things enter into the minds of most of the public concerning safety of RADAR. My first concern came not from RADAR, but installing the VHF antenna. The disclaimer from the manufacturer made me wonder what sort of exposure I was subjecting myself to so as an engineer I dug into the literature and found little help there. I also have an uncle with a PhD in Nuclear / Medical Physics and he was not able to help. Less is probably better, but use it when you need it is how I feel. There’s no mention on the chart of the 25degree horizontal beam typical of marine radars which I believe is the 3db point. I thought Raymarine’s analog domes came with 1 meter minimum safe distance all around . On my own boat I wouldn’t want to be anywhere in that 25degree horizontal beam fan forward. There are stories up here (Victoria BC)of the Coast Guard ribs that had radar at head level,lots of reports of severe headaches and even temporary blindness! As explained by the OET document, determination of safe distance is based on TWO things: ANTENNA GAIN and AVERAGE POWER. The safe distance is the distance at which the power density (watts per square meter) created by the combination of the antenna and the transmitter has fallen to an acceptable level. Antennas have the ability to focus energy (Think of a magnifying glass and using that to burn wood etc by focusing the sun to a point). So large open arrays have higher gain and increase the power intensity over a given area. All marine antennas focus the beam into a vertical fan shape that causes extensive vertical exposure area for users. Average power of the FM-CW based BR by Navico is less than 0.1 watt because the power is transmitted roughly 20 – 25% of the time (per detailed user manual data of the waveform), while Magnetron radars rarely exceed 0.1% “on time”. So you can estimate average power of a “Maggy” as 0.001 * Maggy Peak power. 0.001 * 4000 Watts = 4Watts Vs the 0.1 * 0.25 = 0.025 watts average for BR. Safe distance is then computed by using that average power and the gain of the antenna to determine power density across an area. That is what determines if human tissue is at risk. So 25 Kw Ship Radars with 6ft bar antennas require longer safe distances than do the 4 KW, 4ft bar antenna systems. Occupational exposure is assumed to be LESS than Consumer because the consumer is in constant use of a device while occupation is only maintenance exposure – brief. For my money however – while average power does the “cooking” and damage to tissue, the peak power still exposes your DNA to very high electric field strengths that may cause effects not yet documented. Cell phones are strictly average power ~ peak power so they pose a threat from the standpoint of “cooking” tissue only. Only radar has this “issue” of Peak Vs Average power. This is not written in a style for the general public, but it’s not that hard to read. Anybody making categorical “does”/”does not” statements should read this. Cancer is hard to study because there may be years or decades between the cause and the effect. This section lists the studies which have been done, with both positive and negative results. Not enough studies have been done, the ones which have been done have problems, results are inconsistent. There is insufficient information on the biological and health effects of EMF exposure of human populations and experimental animals to provide a rigorous basis for establishing safety factors over the whole frequency range and for all frequency modulations. THAT is mostintersting. It is the first time that I have seen an official statement that High Power Pulsed energy is more likely to cause biological “response” than CW power. That, combined with the very low CW power confirms that BR is safer than pulse. Warning, the following comment has a RANT imbedded. I have a great idea for next generation radars. It comes from my recent experience day before last traveling 50 miles in fog, and reinforced by previous years of experience, … and rather than play off the FUD factor of radiation, this feature gets to the heart of a real safety issue in regards to radar assisted collisions by users who don’t follow the navigation rules. The new feature … “voice commands to avoid collisions” would voice an approriate response (“turn to starboard to avoid’ or “hold your course”) after a user somehow choose that their visability is limited and choose a radar target they deem a risk … to voice or display an appropriate change of course based on if the target is abaff/abeam (or not) of the appropriate navigation rule in restricted visability with radar only. I reproduce a request for information on radar hazardous emmissions dated 16th Oct 2006. I apologise for the length but I know many Panbots will be familiar with the lack of knowledge (or support) on the part of the customer support technicians. Indeed, most of my technical knowledge is derived from Panbo. Some flying bridge boats have located the radar scanner in line with the heads of helmsman and/or passengers. What are the safety guidelines in respect of the effect of radar emissions on personnel? This is a artical written by our department on the installation of Radars on boats. This is the view of our department and other people will have different views. Mounting of the radome scanner on the mast is very popular and very much typical for yacht installations for 2 main reasons: 1) safety and 2) range, but there are important considerations to take in account when mounting the radome scanner on the mast. In terms of safety, this offers an ideal location as the transmitter is well above head height avoiding mechanical danger (not so much for a radome scanner as it is enclosed) and electromagnetic contact removing the potential for compromising personal health on-board when the radar system is operated for long periods and minimising exposure to the crew. Also, with respect to range of the radar system, since radar basically operates at line-of-sight and so, the suggestion of higher the mounting position, the longer the range performance but this is not always the case, remembering that a yacht will be moving and so, the boat will be ‘heeling’ and so, remember the radar antenna will be as well. Increased height will offer improved long-range performance but at the same time, increases the minimum short-range detection circle as well as exaggerate any rolling or pitching motion of the vessel. Therefore, a compromise as such is necessary in attempt to mount the radar scanner as high as possible but take into consideration, the movement of the vessel… so a simple equation can be used to calculate the distance to the radar horizon which is approximately 1.2 times the square root of the height of the scanner. For example, a scanner mounted 20′ above the water-line will provide the radar of 5.4 miles range before the radar beam is ‘blocked’ by the earth’s curvature. Immediately, you may say this is contrary to the marketed maximum range scale of the radar but there are two factors to take into consideration with regards to radar range: 1) height of the antenna and 2) height of the target, so the same equation can used to determine the targets radar horizon, by using the sum of the distance to the targets radar horizon to the maximum radar horizon to derive the maximum detection range for that target. So same example, a scanner mounted 20′ above the water-line will provide the radar of 5.4 miles range, radiating a target that is 20′ feet tall, can detect that target at a maximum range of 10.8 miles, also remembering that atmospheric and weather conditions can either increase/decrease the range. As already mentioned the main problem for sailboat installations for radar is ‘heeling’, all Raymarine radar products have a vertical beamwidth of 25 degrees, meaning that 12.5 degrees of the beam is directed downward toward the water and 12.5 degrees directed upward with the centre aimed at the horizon. 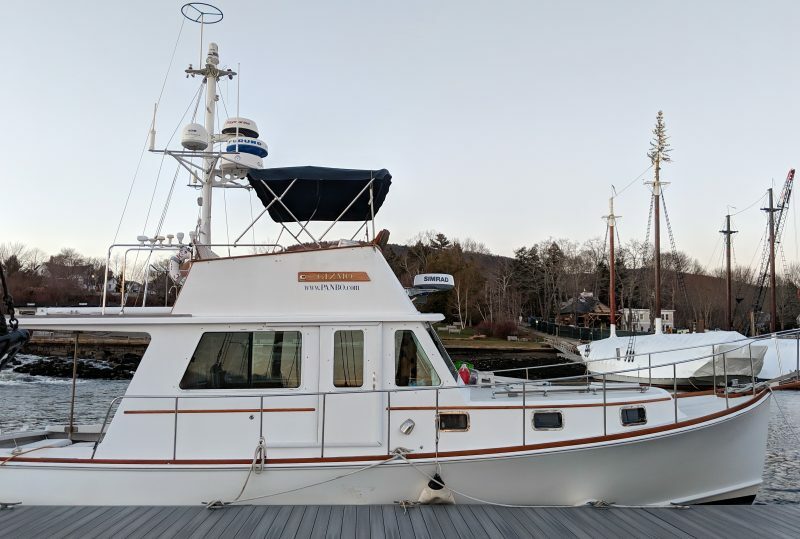 If the boat is heeling in excess of 12.5 degrees port or starboard, the lower beam will be directed above the horizon and essentially rendering the radar blind in that direction. Additionally, all of the radar energy will be directed into the water, resulting in increased sea clutter… from this aspect, you will heed the benefit a ‘gimbal’ style mast mounting, which will abolish this problem, maintaining the radar antenna parallel to the waterline. Another factor to take into consideration is ‘blind spots’ which can be evolved as a result of detection of masts and booms, if the antenna is mast-mounted, the radar will block the sight of the radar in the direction of the mast, on a typical mast mounted installation, the radar can be subjected to a blind spot of 1 to 15 degrees wide (this is obviously unavoidable) depending on the mast thickness. However, because this is directly astern, it is relatively of lower concern to the user, as generally the higher risk is forward, port and starboard of the vessel. This is potentially where a backstay installation is preferred with ‘some’ distance between the antenna and the mast, there will be a small blind spot in the direction of the mast. Additionally, this is also a reason why ‘some’ scanner installations are located aside of the mast on the spreaders as a combination of the movement of the vessel and the intelligent software used within the Raymarine radar products, it is very unlikely to detect a blind spot visually on the radar display. Therefore, personal view is that a radar antenna mounted on the backstay using a gimballed mounting is the best choice for a sailboat, although you will sacrifice range performance by mounting the antenna lower and at the same time increasing short range detection, and you will minimise the probability of blind spots BUT remembering the safety aspect with an antenna mounted overhead. Typically, a radome scanner when mast mounted will be installed on the forward facing of the mast and in some cases, is protected using a radar guard to prevent the sails and rigging from ‘hitting’ or ‘snagging’ on the radome scanner. With the cable run, a high number of sailboats are removed from the water and the mast is ‘stepped’ and so, it is recommended that the cable is passed through a waterproof deck gland and a suitable junction is applied to the cable using a suitable waterproof junction box, located inside the boat. CONCLUSION: the preferred mounting would be on the cross-trees as initially suggested by the customer, offsetting the antenna on the cross-trees should not present an hindrance to the performance of the radar system; in terms of mounting the scanner to the mast, Raymarine do supply a standard mast mounting bracket which would not facilitate the required mounting, suggestion would be to contact Scanstrut (www.scanstrut.com) for recommended mounting solutions but the probability is that a purpose-fabricated bracket will be necessary. speaking, do not have masts, back-stays, rigging or sails. the microwave transmissions from the radar antenna. as irrelevant to my issue. Electromagnetic Energy. The radar scanner transmits electromagnetic energy. It is important that the radar is turned off whenever personnel are required to come close to the scanner to perform work on the scanner assembly or associated equipment. It is recommended that the radar scanner is mounted out of range of personnel (above head height). Do not look directly at the antenna at close range as your eyes are the most sensitive part of the body to electromagnetic energy. Human Exposure to Radio Frequency Electromagnetic Fields, 3 Hz to 300 GHz and NRPB, Board Statement on Restrictions on Human Exposure to Static and Time Varying Electromagnetic Fields and Radiation, Doc NRPB, No. 5 (1993). If you want the full guidelines they are available from the EU body who set these out. All our Radar units comply to these regulations. I still don’t feel like I know for sure. They key words here are “for sure”. Give up on “for sure” for now and probably for a very long time. There are some risks, we don’t know exactly what those risks are, but they are probably very small. Put in a way a sailor would understand, we are in waters for which the surveys and the charts are poor. If we look at the chart and see no rocks, that does not guarantee that there are no rocks. But some areas are better known than others, so if you stay in the recommended area you are safer, but still not guaranteed safe. The science is not good enough yet to say exactly what is safe and what is not, but the guidelines based on that science should provide some security, and not least, some protection from lawsuits against manufacturers and installers. But everyone should be able to think of some things that used to be thought safe that are now thought dangerous, so it’s best to remember that the guidelines could change either way as more evidence is found. Data collected from cell phone users may help answer this question, but I don’t expect proof one way or the other for a long time. Meanwhile, I won’t be pushing the envelope on this. Tim’s piece is great. Over the top Great. I had misunderstood this issue, thinking there was at least a tiny risk of being near a radar dome. However, this isn’t like x-rays or other types of radiation associated with a statistical risk of cancer even if the exposure is small .. the kind of risk where you never know when one particular exposure was the unlucky one that caused cell damage that snowballs into cancer. Not the case at all. No cancer risk. We are talking about heat … and the inability of the radar to generate more heat than the ability of our bodies to dissipate (Tim wrote “the body can withstand a heat load of about 4 watts per kilogram (kg)”.) If the amount of heat generated is less than what our body dissipates … no cell damage period, e.g. the radar is unable to “cook” human tissue any more than holding your hand against a warm TV screen could burn you. Maybe a little scary that this type of energy doesn�t stop at the boundary of your skin and instead penetrates into your flesh … but the fact it doesn�t stop at your skin makes your body even better able to dissipate the heat. As it turns out, our radars are generating nothing near the 4 watts per kg our bodies are able to dissipate. The table at the top would be NIL for all radars, if it was not for the various authorities having created safety standards with an additional margin of safety of up to 50 x. (e.g. rather than 4 watts of heat per kg, they set limits at .04 or .08 watts depending on occupational or not). 50x, that’s a lot of safety margin. I realize from readings Tim’s piece there is the issue that cells in our eyes (that need to be transparent) don’t have the blood flow to remove the same 4 watts per kg as other cells making them much more sensitive, but the 50x safety margins seems to still be way over the top. Not only won’t the radar cook you … you would surely freeze to death if all you had was a recreational radar to keep you warm on a cold winter night. The other thing that caught my eye is that the table is incorrect, showing safety distances that are much much to high based on this 50x safety margin. Tim makes a compelling point that the tables don’t take into account that the radar is spinning, preventing it from delivering that heat when it’s facing away from you. For all it’s elegant math, the researcher left out the very important consideration … that even if you stood right up to the radar, no one point in your body could get 30% of the emissions (that 30% applies even if you wrap your arms around it and hug it, the radar is not delivering that heat to any one part of your body for 70% of it’s rotation). I extrapolate that it would be about 15% from one foot away. Without doing any tough math, it would seem that many entry’s in the table comparing radars would be changed to NIL or .3 meters (1 foot) or less if the fact that the radar is rotating is taken into consideration. If the researcher did take that into account .. it wouldn’t be at all helpful in showing that the BR24 is safer as all radars would be safe. So, if it isn’t already safe to go hug our radars at eye level without cooking ourselves (after adjusting the table to be correct) .. just stand back about 12 inches before looking at your radar at eye level and you will be within the safety limits where your body can dissipate all the heat the radar is generating per the wild safety margins built in, and have no cell damage whatsoever. Tim � I am counting on your research here, you�re my sole source for this last comment. Interesting that it cooked the candy bar and not his eyes, an organ written about in one of the white papers as having the least amount of capability to have heat removed continuously by the body. Pregnancy Wi-Fi causes controversy, article appears today. I was reading this article on BBC news today, and it brought me back to recalling this Panbo entry about radars. If you understand how radars (non ionizing wavelength) are harmless to our bodies, than you can have a laugh as a wi-fi manufacturer markets a safer wi-fi product. Safer, they claim, because it has an optional lower power setting for use around pregnant women.